The Spellspinners of Melas County is a fantasy YA romance series about a witch, a warlock, and their fight for their forbidden but prophesied love. 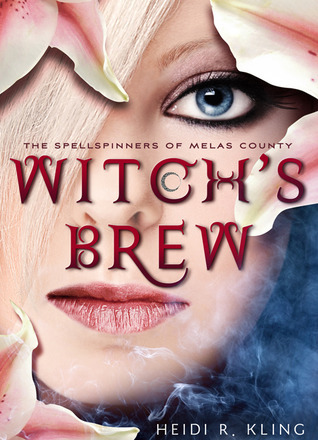 In Witch’s Brew, Lily is torn between her feelings for Logan and her coven’s need to know who—or what—he is. The young lovers race against time, their distrust for each other, and the powerful influence of their elders to unravel the mystery of their pasts before their future is destroyed. “Active fiction” is a new type of e-reading experience that allows the reader and the author to interact with each other and the text in new and different ways. In Witch’s Brew, Lily and Logan’s fate is already decided, but Heidi explores several different possible pathways for how they get there. She shares scenes that wouldn’t normally fit in a book format and gives readers more precious moments between the two young lovers. As the series progresses, you’ll see some normal narrative forms, interspersed with smaller scenes, alternate points of view, and a lot of “what if” scenarios. Okay, so this actually turned out to be a remarkably sweet story. I was worried that there would be an insta-love connection (which nobody ever seems to enjoy), but instead there was more of an instant connection that invoked guilt and confusion. I loved the way the relationship was sparked, and was built on. Love is far from simple, and Kling showed this perfectly. The main characters are likeable, and the villains are not, just as they should be. Not everyone can be categorized so easily though. I love when there are a few characters with ambiguous allegiance. Are they grouchy good guys, or do they have an ulterior motives? Are the bad guys actually bad, or are they just misunderstood? It makes me start to guess and second guess, which makes the journey so much more fun! I love not being able to figure the whole story out! I was a little overwhelmed by the complex details in the beginning. First off, I had to work out how the magic works. All “witch” books are going to have their own spin to how magic works, so I made sure to take a few pages to get my feet under me. Then, there are the characters, and the backstory and history. Add to that the set up for the future of the series, and it’s a lot for a reader to absorb. Once I got my bearings, though, I really enjoyed this! The first time anyway… This brings me to the twist: you get to select your pathway through the story, through a series of links, to decide how the characters will get to the finish. I was curious to see how this would affect the ending, since there are sequels. How can you possibly read a second book, when you’re not even sure if you picked the right ending?! It is, however, just their path that you get to choose. The ending is stable when you finally get there. While the “choose your own adventure” style is fun and quirky, I could have done without it. I felt compelled to read it again (because I can’t leave a book half read like that). My first pass over the book was actually much better than the second, the story coming together in a more solid way the first time. I felt like the chemistry between Lily and Logan was more heated and believable. A reader’s enjoyment could easily differ depending on what choices they make for the story. It also makes it near impossible for me to give a rating to it. I can definitely recommend it though, if you’re in the mood for a light, PNR. I look forward to seeing where the story takes me in The Gleaning!